In 2014 we celebrated the 10th annual Get Your Rear in Gear – Twin Cities, the race that started it all. The evolution of the Colon Cancer Coalition has taken us from one race in 2005 to a nationally recognized partner in the fight against colon cancer. Based in Minneapolis, Minn., we are dedicated to encouraging screening and raising awareness of colorectal cancer. Our signature Get Your Rear in Gear® and Tour de Tush® event series are volunteer-driven in communities throughout the United States. In 2017 alone we granted over $1 million to local community programs that will raise screening rates, increase awareness, and educate the public about the signs and symptoms of this disease. 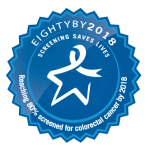 As a member of the National Colorectal Cancer Roundtable (NCCRT), we are committed to raising screening rates to 80% to further halt this preventable cancer. Our community-based events put us in the unique position of being able to fund this goal at the community level and invest in programs that will drive home the importance of screening. Our success is evident in the screening programs we are able to build and support in areas across the country, but 1 in 3 adults over 50 are still not up-to-date on their colon cancer screening. The survival rate for colon cancer is 90% when it is caught in the early localized stages. Unfortunately only 40% of cases are being diagnosed in this window. We are dedicated to reaching 80% screening by the year 2018, reaching that goal means we can save more than 200,000 lives before 2030. By focusing on the patient and community, and providing them and their families an outlet to tell their story, we are able to educate the community about the importance of colorectal cancer screening. Since 2004, millions of dollars have been granted by the Colon Cancer Coalition to local programs that promote early prevention, screening, and patient support services for this disease. By making the words colon, colorectal and colonoscopy a part of the everyday language, we believe we can overcome the fear and decrease deaths from this largely preventable cancer. We invite you to GET YOUR REAR IN GEAR. Volunteer to drive someone you know to their colonoscopy. Know your body and take notes when something isn’t right. Raise the red flag with your doctor when there is a problem and engage them to find the answers. Talk to your family about their medical history, not just for cancer, but also other gastrointestinal issues. 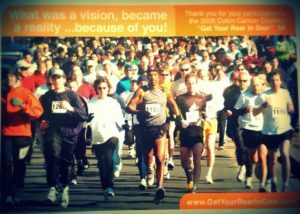 Make a gift to the Colon Cancer Coalition to help us spread our message. Today, survivors, family and friends across America are joining our grassroots movement to raise awareness and screening rates for colon cancer. We’re committed to empowering personal change on a national level by bringing understanding, raising awareness and eliminating fear of colon cancer. “Get Your Rear in Gear®” is bigger than just a message for colon cancer; it is a message for all of us to take action, lead longer and healthier lives, and when something isn’t right to get the answers we need.